Temporomandibular joint (TMJ) disorder is a fairly common oral health condition that affects nearly 10 million people in the United States and occurs as a result of inflamed and irritated temporomandibular joints. These hinge joints, located in front of each ear, and are what connect your skull and jawbone and provide an important role of opening and closing your mouth. As the most frequently used joints, when they become inflamed and irritated, patients can experience bothersome symptoms, such as facial pain, swelling, and difficulty eating. Dr. Abbey J. Lee provides a variety of TMJ disorder treatments at our Atlanta, GA practice to alleviate symptoms. When caught early, TMJ disorder can generally be effectively treated with conservative treatments before developing into something more serious. As a highly trained and experienced dentist with over 25 years of experience, Dr. Lee is committed to providing patients with the best possible care using tried and proven methods, as well as revolutionary techniques introduced in the dental industry. Mouthguard: This oral device is worn at night and recommended for patients who struggle with unconscious teeth grinding and jaw clenching to protect the teeth, as well as the joints and muscles within the jaw. A mouthguard is customized to comfortably fit over teeth while also slightly pushing your lower jaw in a forward, relaxed position to alleviate jaw pressure. Dental Orthotics: This specialized oral device is designed to facilitate a gradual, yet permanent change to a patient’s bite to heal and stabilize the joints and muscles in the jaw. Compared to other oral devices, this is an orthopedic appliance designed to be worn daily, 24 hours a day as directed until the jaw is corrected. Full Mouth Reconstruction: For patients with a number of concerns, such as damaged, decayed, misaligned, and missing teeth causing improper bite alignment, Dr. Lee can create a personalized treatment plan with multiple restorative and cosmetic procedures designed to correct your bite and alleviate jaw pressure. A full mouth reconstruction can include repairing teeth with dental crowns, dental implants, dental bridges, or orthodontic treatment. TENS Therapy: Also known as transcutaneous electronic nerve stimulation, this type of therapy relaxes the muscles within the jaw through low-frequency electrodes. As the muscles are stimulated and gently massaged, it alleviates muscle tension, eliminates toxins, and releases endorphins that can help minimize discomfort. After a number of sessions, Dr. Lee can determine whether additional forms of treatment are necessary to improve your results. Oral Athletic Guard: This oral device is more of a preventative measure. Any adult, teenager, or child who plays contact sports should wear an athletic guard to prevent tooth damage and jaw injury. Although athletic guards can be found at your local athletic supply company, having a customized mouth guard provides the ultimate fit and protection. Orthodontics: Dental misalignment and malocclusion (faulty bite) not only create aesthetic concerns, but they can cause jaw pressure and bothersome pain. Dr. Lee provides traditional metal braces and Invisalign® to help straighten teeth and realign jaws. 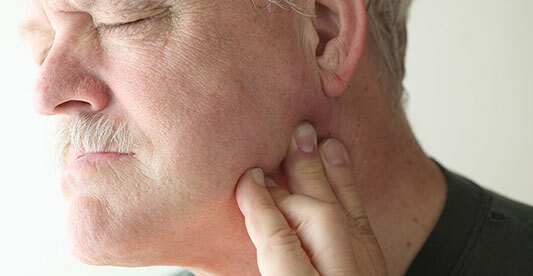 If you are battling chronic jaw pain in addition to any of the other symptoms listed above, you may have TMJ disorder. Contact Smiles 4 Grant Park today via email or by calling 404.328.7177 to schedule your consultation with Dr. Lee.